The Department of City Planning is proposing the first comprehensive rezoning of the Upper West Side in almost 50 years. The battle mostly started by the Ariel Condominiums - two 30 plus story towers currently rising on Broadway between 99th and 100th streets. The buildings have led to some neighborhood opposition because of their height. The rezoning calls for height limits on new construction that would see most future developments rise less than half the height of Ariel Towers, the New York Sun and The Real Deal reported. In my Morningside Heights Market Report there is more information about Ariel condos and the landmak Art Deco Metro Theatre next door that remains. When I was photographing the theatre for my blog several people I talked to in the neighborhood thought they were office buildings until I told them they are residential condos. In my Upper West Side Market Report I discuss the fact that between 72nd Street and 96th Street (the true Upper West Side) buildings are not taller than around 20 stories and are mostly pre-war. Between 59th and 72nd - Lincoln Square has been zoned for very tall buildings including The Time Warner Center and Trump Place. Above 96th Street in Morningside Heights, The Columbia at the North West corner of Broadway and 96th is 33 stories and was built in 1983. 165 West 86th St. A 21-story residential building is being erected ajoining the West Park Presbyterian Church. The project will have separate entrances for its 50 affordable studio rentals on floors five through 10, and its 27 market-rate condominiums on floors 11 through 21. Some community members are saying the separate entrances will create "segregation" in the building. Two blocks west at 86th and West End Avenue. The methodist Church of St. Paul and St. Andrew tried to raze their 100 year old church and build a 20 story condo. They turned down $6 million for their air rights from the developers of The Boulevard at 86th and Broadway back in 1989. They have been unsuccessful in their hardship claim to change their landmark status since the community has helped them out with repairs. 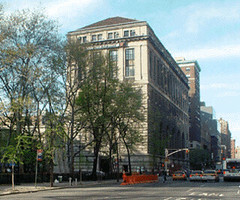 B'Nai Jeshuron on west 88th St also came to the rescue of the Church because they have such a large congregation they have been renting the Church of St Paul and St Andrew for Shabot services and Jewish holidays. Sales have begun for the condominium conversion of a 13-story, 96 unit prewar rental building. The project will include two new construction penthouses with private outdoor space. One to four bedroom apartments are priced from $714,000 to $2.738 million and range in size from 766 to 3,647 square feet. Three and Four bedroom condominiums are for sale pre-construction prices starting from $2,495,000 and full floor residences priced from $6,350,000. Sales will begin this summer for The Harrison a new luxury condominium in the heart of The Upper West side. 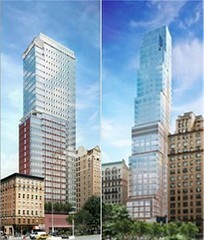 Several other new projects are slated for the Upper West Side. To receive listings on current new devolpments and future projects click here.